"I know there are many questions that a lot of Chicagoans have on how the city will react to the verdict," Mayor Rahm Emanuel said. Update, Friday, Oct. 5: Chicago Police Officer Jason Van Dyke on Friday was found guilty of second degree murder for the shooting death of 17-year-old Laquon McDonald. Follow live coverage and analysis from NBC Chicago here. With a verdict in in the trial for police officer Jason Van Dyke, who fatally shot Chicago teenager Laquan McDonald nearly four years ago, Mayor Rahm Emanuel on Friday called on Chicagoans to be respectful once the results are announced. 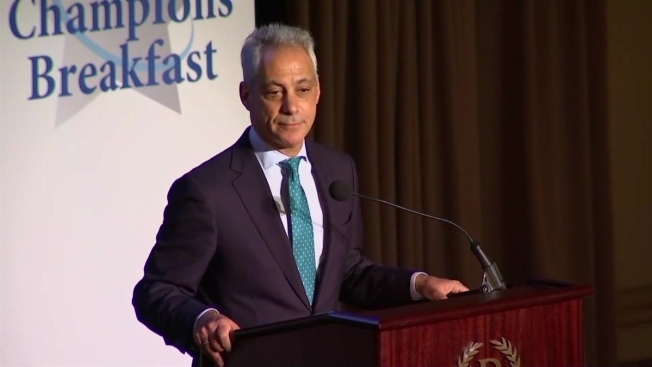 "This is our city and this is our home," Emanuel said during a morning breakfast speech, "and I hope that everybody heeds the advice of Laquan McDonald's family, the pastors and community leaders, to make their message heard and what they have to say and do it in a way that's respectful to the city we all call home." "As the jury is deliberating, I want all of you to know that I have absolute confidence in Superintendent Johnson, his plan and the police department, and I have absolute confidence also in the residents of the city of Chicago," he said. News of the verdict came in just before 1 p.m. and was expected to be read about an hour later. Schools and businesses in the area began preparations, with some letting kids out of school and other enforcing security preparedness plans as they brace for the results. The Chicago Police said the department has spent months preparing for a potentially controversial verdict and promised a "comprehensive operating plan" to make sure the city is safe. Officers' shifts were extended and an increased police presence has already been felt ahead of a verdict. Schools are preparing for early dismissals should the verdict be announced during school hours, as well as the cancellation of after-school events and potential cancellations of classes. Some groups have called for protests if Van Dyke is acquitted of first-degree murder charges. Van Dyke faces two counts of first-degree murder, 16 counts of aggravated battery and one count of official misconduct for firing 16 shots at McDonald the night of Oct. 20, 2014. Van Dyke has pleaded not guilty in the case. "Whatever the verdict is," Emanuel said, "our work as a city is not done in bridging and helping community relations between the police department and the residents of the city of Chicago."